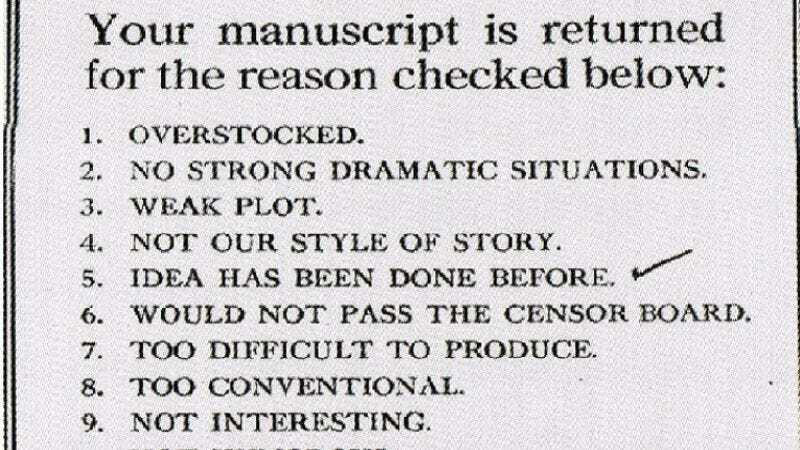 The good people at Retronaut have uncovered a relic from the early days of the silver screen that would probably singlehandedly streamline every studio in America if it were still in use: a manuscript rejection template in the form of an easy-to-use checklist. The template in question was made by the Essanay Film Manufacturing Company, a studio from the first quarter of the last century that was best known for producing the early work of Charlie Chaplin. But the form most likely wouldn't be used today, in part because it's concise to the point of cruelty, but mostly because the standards for acceptance back then were shockingly crotchety. In addition to listing the expected stylistic objections (namely "NOT INTERESTING," "NOT HUMOROUS," and the blunt but incontrovertible "WEAK PLOT"), the form also ruled out anything that was "IMPROBABLE" or included scenes in a "FOREIGN SETTING" or "OF AN UNPLEASANT NATURE." Of course, the studio had the last laugh when it produced its masterpiece, Man Sits At Home, Has A Disconcerting Thought, Then Moves On.